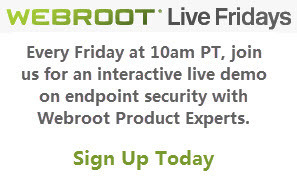 Live Fridays with Webroot Product Experts! Attention all IT professionals and security leaders! Join us for a free, 30-minute Live Friday interactive demo this Friday, June 1st - and EVERY Friday - at 10:00am (PDT). You’ll find out how Webroot SecureAnywhere Business — Endpoint Protection gives you fastest, least disruptive and most effective business security. Sign up to attend this week's session.